What does it mean to express a Buddhist response to climate change? What does our wisdom tradition and our love for this life call us to do? How can we respond with wisdom, compassion and courage? 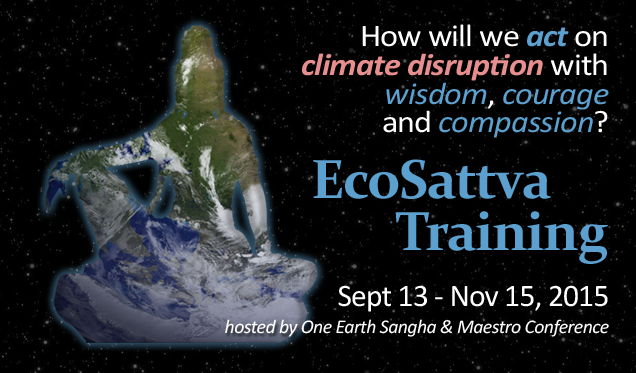 Join a powerful collection of other teachers, activists and experts for our online, interactive EcoSattva Training. This course will develop our community’s capacity to effectively engage on climate change and other ecological challenges, both thematically and locally, with courage, compassion and wisdom. We invite you to join us for this series of important sessions hosted by Thanissara, One Earth Sangha and Maestro Conversations. You can join this course as an individual, through http://www.oneearthsangha.org/programs/ecosattva-training/ Or you can join a local group, supporting each other and considering how to act, together and individually. Fee through group will probably be $30-50, and we will set our times to work for group members. Individual fee is more, though scholarships are available on request. To participate in the group, please contact Shodo Spring, shodo.spring@gmail.com, 507-384-8541.